Blackjack is one of the most popular casino games and as such, it has many card counting systems, especially designed for it. They differ in terms of the assigned point values but their main purpose, to help players make better choices and bets, remains the same. Some systems have their variations as well which are usually their improved version over the course of time. Even though card counting strategies are considered appropriate only for proficient players, there are many simplified methods suitable for beginners. Contrary to the popular belief these strategies don’t require incredible mathematical skills for doing difficult calculations. In fact, many of them have been simplified significantly in order to ease the counting process as much as possible. One such a basic card counting system is called Red Seven. It is a method which allows players to gain advantage over the casino and increase their profit and this is the reason why it grew in popularity over the past few years. It is very reliable and at the same time easy to be understood and learned which makes it a very good option for players who don’t have much experience with the card counting systems. The Red Seven system was established in 1983 by the professional gambler Arnold Snyder and since then, it has been trusted by many players. Mr. Snyder is the author of many successful books, including the Big Book of Blackjack and Blackbelt in Blackjack. His works changed how the card counting was perceived and influenced many of the gambling methods known today. His most famous book The Blackjack Formula, published in 1980, draw the attention to the important role of the deck penetration in the card counting strategies. The deck penetration is calculated in percentage and it refers to the already dealt cards prior to reshuffling. It is not a basic term and it is of no use for players who apply the basic strategy, however the case is different for card counters and it is very important that they are familiar with it. The Red Seven system is not an exception when it comes to using the principle of assigning a particular point value to the different ranks of the cards in the deck. Players need to apply this system in the process of counting in order to place themselves in a favourable position and gain advantage over the casino. Thanks to it, keeping track of the cards is much more easier and even beginners have the chance to succeed in this enterprise. 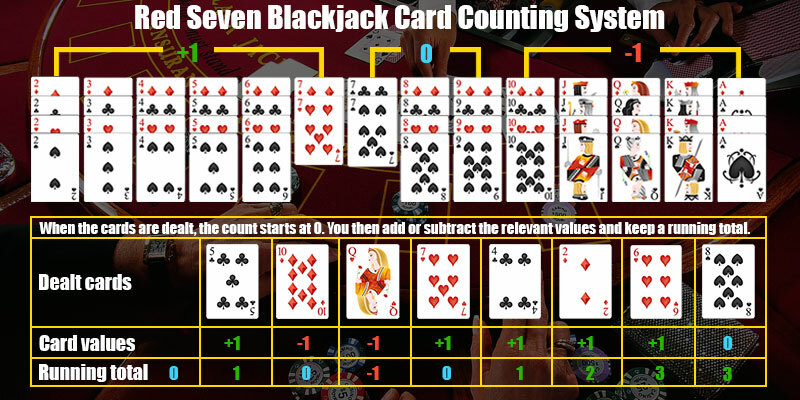 The cards in this system are valued as follows: from two through six, they get plus one, a ten and the face cards are counted as minus one and eight and nine receive a count of zero. The number seven plays a very important part in this method as it is valued differently depending on the colour. The name of the system can be used as a reminder in case players forget about this subtlety. The rule is that red seven gets plus one and black seven – zero. The level of count of the Red Seven system is one which indicates that this strategy is more simplified and appropriate not only for proficient players but also for beginners. It is also worth mentioning that it is an unbalanced card counting system, meaning that if players were to count all of the cards in a deck, at the end their count would be plus two instead of zero. This is the reason why players should start their count from minus two, providing that they are playing with one deck. However, sometimes it can be very hard to find a place where Blackjack is played with a single deck and therefore, players need to be prepared for the cases where multiple decks are involved as they will certainly be more. If the game is played with more than one deck, they should multiply their number by minus two. For instance, if the game includes four decks, the start count should be minus eight. Probably the biggest advantage of this system is that it is both efficient and simplified which makes it moderately easy to be comprehended and therefore, applied when needed. Moreover, it is based on the main principles of the card counting strategies and if players are already aware of them, it won’t be a problem to memorise it. Just like any other card counting system, it gives them the valuable opportunity to adjust their wagers accordingly and thus, avoid betting high amount of money when their chances of losing the hand are high. The system is quite straightforward and as long as players manage to concentrate and keep track of the cards, they will surely benefit from it. They need to bear in mind that whenever the count is positive, they are in a favourable position and thus, need to make the most of it. Moreover, the higher the count is, the better the chances of winning the hand are and therefore, players should increase their bets. Red Seven is a card counting system, used by hundreds of players worldwide. It has been especially designed to be not only reliable but also easy to comprehend. There are much more complicated systems available which assure even better accuracy and effectiveness, however players need to take into consideration some important factors which will influence their performance as well. For instance, the casino setting plays a crucial role and inexperienced players might find it hard to focus for the needed period of time due to the many distractions that they are bound to face at some point. This is the reason why they should pick a simplified strategy which is easy to remember and follow in order to avoid getting lost in the counting process and losing money. After all, card counting is a strategy for players who want to improve their game and make the most of every hand with what they have.